Well, friends, winter is still here, but Christmas is over. It’s like we live in Narnia before Aslan came: always winter, and never Christmas. I get it. I live in Wisconsin, where winter is approximately 10 months long. Are you coming down with a serious case of cabin fever? So are my kids. We’ve all become rather growly, like bears sick of hibernating. What’s a mama to do with these growly cubs antsy kids? More importantly: Can you blame them? You know the importance of gross motor skills, and you know the AAP recommends at least 1-2 hours per day of physical activity for your little ones. But running laps around the living room is getting a little old. Lucky for you, I have 28 indoor games for kids that are guaranteed to burn off some of that grumpy energy—for you and for your child! Do one each day, and they will keep your kiddo active indoors for a whole month. For even more ideas to make your long winter more fun, check out these four silly winter holidays. Take that, White Witch of Narnia! Sometimes, you can just borrow activities that you usually do outdoors. But, the fact that you’re doing an outside activity inside makes it so much more exciting! Suddenly, the slide your kid never usually goes on more than once will provide an hour of entertainment. Why? Because it’s inside, of course. It’s magic, really. There are no secret rules to this game. It’s as straightforward as it sounds. How often does your little one get to play on a slide inside the house? For a fun twist, she can slide onto a pile of pillows or into this ball pit filled with brightly colored balls. OK, so a picnic isn’t an active game. But think of all the backyard games you can play inside after you’re finished eating on a blanket on the living room floor! Pick up a bubble machine and some bubble solution. Or just grab a bottle of bubbles; you can blow them yourself or use a fan. Then, have a race to see who can pop the most bubbles in 30 seconds! For older kids, you can also work together to see how long you can keep a bubble from hitting the ground by blowing it. Get even more creative by having them blow the bubble to the finish line of a masking tape path you make on the ground. What better way to help your growly cabin fever bear cub than to take him on his own bear hunt? Start by reading the book We’re Going on a Bear Hunt, then look for your own teddy bears around the house by making an obstacle course and using a homemade map! Check out this post from B-Inspired Mama for some more ideas for your bear hunt. Grab a small trampoline with a handle for your child to burn off some of his energy after all of his hibernating. This awesome option folds up and is easy to assemble, so you can store it away when it’s not in use! Brilliant. It’s an oldie, but a goodie! Take turns being the leader, and the ones following have to do whatever the leader does. Just play for fun, or make a rule that if you miss one, you’re out. Keep the game going by coming up with really wacky new ideas for your child to follow. Or, try to be sneaky, do some cleaning, and let him help! I know what you may be thinking: Ok, lady, those games are fun and all, but what about when my child has all the energy, but I’m totally wiped out? Don’t worry, mama. I’ve got you covered. Check out these six ideas. When you’ve exhausted the six options below, be sure to check out Karen’s great list of 12 ways to engage your child from the comfort of your couch. Want to know the best part about Simon Says? All Simon has to do is sit there and say stuff! Simon says “go pick up all your toys….” That one didn’t fly? Oh, well. It was worth a shot. To do a color scavenger hunt, simply send your little one around the house to find different-colored items and have him bring them to you. (e.g. “Find me something green. Go!” or “Find me a purple toy!”) Bonus: He will learn his colors as he plays. If you have more than one bustling bear to play with, you can have them race to see who can find an object faster. The only other rule in this game is that your child has to put each item back before he can play the next round (unless you want to play clean-up after the game is over)! Ok, so this one does require some set-up. But, hopefully the maze will keep your child busy long enough to make the set-up worth it as well as give you a few minutes to drink your coffee in peace. And if your kiddo is old enough, she can help you set it up! To play, tape crepe paper across your hallway up high, down low, diagonally, in all directions. To visualize what I’m talking about, check out this helpful guide from Brassy Apple. Then, let your child practice her ninja skills by trying to get from one end of the hall to the other without touching the crepe paper. You can cheer her on from the sidelines and time her so she can try to beat her own record! Here’s another activity for which you can’t just completely be lazy on the couch. But it is a good one to get your child’s energy out while you really don’t have to move much. When she’s the one hiding, you can walk in a leisurely fashion around the house till you find her. When you’re the one hiding, buy a few extra minutes of rest by finding a really good hiding spot. This is one of the best indoor games for kids. First, grab this free Alphabet Cards printable from Homeschool Share. Turn on some music, and have your kiddo do each activity for 30 seconds at a time, starting with A (Ankle Circles), all the way through Z (Zigzag Running). Chances are, he’ll want to do the whole thing over again once you go through the alphabet. Your only job for this game is to facilitate. My preschooler and I invented this game last winter when we were all tired of hibernating. First, set up a 4-way tunnel like this one in your living room. Have your little one leave for a minute while you put a bunch of toys throughout the tunnels (and write them down if you think you’ll forget them). Then, choose a starting point. When you say “go,” he has to find whatever object you call out and then bring it back to you at the starting point. Keep it interesting by cheering him on and timing him to see which item he finds the fastest! Of course, another variation would be to hide them in different rooms of the house or all over the house. The possibilities are endless! If you ever want to keep a kid entertained for hours, all you need is a balloon. It doesn’t even need to be a fancy helium balloon. In fact, for these games, inexpensive balloons you blow up yourself are perfect (and you can get a whole bag of them at the dollar store). Indoor Game #14: Keep It Up! This game is really easy to learn. The only goal is to not let the balloon touch the floor. Play with more than one balloon. Make a rule that one person can’t hit the balloon two times in a row. Give each person a different-colored balloon and see who can keep her balloon up longer. Cooperatively play “three strikes and you’re out” and see who lasts longest. Ok, so this is not much different than regular Simon Says. But when I suggested this idea to my three-year-old, she was so excited, as though it was a completely new game. Just play like normal, but make every command involve a balloon: “Balloon Bert says throw the balloon in the air,” or “Balloon Bert says jump over the balloon.” Excellent. For balloon tennis, make and decorate some tennis rackets with jumbo popsicle sticks and paper plates. Short on time? Use fly swatters. Then check out this awesome list of game variation ideas from Kids’ Craft Room. This is similar to the basketball game H-O-R-S-E, but I’ve named it B-E-A-R in honor of the fact that, well, we’ve all become a bunch of grunting grizzlies lately. Amiright? But you can feel free to spell whatever word you want. Have each person take turns making up a trick to do with the balloon (hit it three times and land it in a laundry basket). Each player who can’t complete the trick gets a letter. Bonus: This game helps teach letters and spelling in addition to gross motor skills! Thanks for the great idea, iHomeschool Network. Hop across the room with the balloon between your knees. Blow the balloon across the room with a straw or paper towel tube. Balance the balloon on a spoon while racing across the room. I don’t know about you, but my biggest obstacle with indoor games for kids is the supplies. Call me lazy, but sometimes gathering all the materials needed for an activity is just too much. Fortunately, these tried-and-true indoor games for kids involve things like blankets and pillows—all items you probably already have around your house. Yessss. Pull the cushions off the couches, grab some chairs and blankets, and get to work! Sometimes we supplement with a play tent or tunnel, but that’s really not necessary to get your little bear cub’s imagination going with building his cave. My daughter loves to make her forts into houses with different rooms. Then she spends hours playing house and tea party in her fort! We love this game. My favorite time to do this activity is when my husband is still not home yet, dinner is in the oven, and the kids are going crazy. I’m pretty sure you know the time of day I’m talking about. I’ll just say, “Let’s make a crash pile!” and suddenly all of that grumbling and moaning energy is redirected! It’s easy to play: Just take a bunch of couch cushions, pillows, and blankets and make a big, wide pile next to your “launching pad” (we use the now-cushionless couch). Then climb up onto the launching pad and jump off into the crash pile! Indoor Game #21: Escape the Hot Lava! Don’t look now, but the floor you’re standing on just turned into hot lava. Quick, set up some pillows (or these great carpet squares) around the floor as stepping stones so you and your little one won’t fall into the lava! The only rules for this game are that you can’t touch the floor, and you have to keep moving or you’re out. But maybe you or your kiddo can come up with some new variations. My sister and I invented this game when we were young, so it holds a very special place in my heart. It is out of the deepest affection that I now impart the knowledge of this game to you. You will need 3-5 people to play. Start by covering the windows so that ZERO light can get into the room where you are playing. Then cover any sharp corners or other hazards with pillows. Players take turns being the Light Switch Guard. The Guard’s job is to prevent the light from being turned on via the light switch. The other players are Sneaky Stealthy Ninja Warriors. The Ninja’s job is to turn the light. Choose a home base that is on the opposite side of the room from the light switch (a bed or chair works great). The game starts with all players in position: The Guard protecting the light switch, and the Ninjas at home base. Game play begins when the light is turned off. Every player (Guard and Ninjas) must carry or wear a glow-in-the dark object at all times (glow-in-the-dark stars work great for this game). The Guard prevents the Ninjas from turning on the light by tagging them. If a Ninja is tagged, he must return to home base. The Guard may not tag a Ninja who is at home base. The Guard may not protect the light switch by constantly keeping his hand over it. Doing so would make the game no fun for anyone. No one may talk during game play. Each round ends when the Ninjas manage to get past the Guard and flip the light switch. Kids may take turns being the Guard, or create a rule that the Ninja who turns on the Light Switch becomes the Guard in the next round. Obligatory disclaimer: Because it involves kids running around in pitch blackness, it’s best to supervise this activity. Kick off your pillow fight by reading through the book Good Night Pillow Fight. Then have a good old-fashioned pillow fight! Of course, it’s good to keep in mind that pillows can still break things (or people), so keep fragile items out of the way and remind your kids to play gently. And maybe use old pillows. And maybe include rules like: no smothering, no holding, and no cushions with zippers or buttons. …Actually, maybe just avoid pillow fights until it’s warm out and you can play outside (unless you’re a type B mom, which I am not). Friend, there are so many resources out there to get your child moving using music and videos. These are only a few of many possibilities for your little bear cub. Develop your child’s gross motor skills while teaching him about animals and music at the same time! This helpful printable from Homeschool Share can be a great starting point. Then, listen to some of these great songs to enhance the experience. Or, get unlimited streaming of all these songs and more by signing up for Amazon Prime! Who said workout DVDs should only be for adults? Here are some great kids’ workout DVDs to get your child’s heart rate up and burn some of her energy! Denise Austin’s Fit Kids is a 20-minute total body workout that incorporates elements of dance, hip-hop, sports drills, and yoga. Kids Get Movin’ is a 45-minute dance workout that will build aerobic capacity, coordination, flexibility, strength, and balance. Shaun T’s Fit Kids Club includes two groovy dance workouts from Beachbody. A Time to Dance is a faith-based workout hip-hop dance DVD that you know will be family-friendly! When your little one tires of a dance party, you can simply play your songs in the background, grab some musical instruments, and have a marching band parade around the house! Can I just say: I’m so grateful that there are people out there who have dedicated their entire careers to acting ridiculous for the sake of my children. Laurie Berkner and Patty Shukla are two of those people. The Goldfish – Swim around your living room till your little goldfish is tired enough for naptime. We Are the Dinosaurs – Get ready to stomp around like dinosaurs! I Know a Chicken – We originally learned about this one at library storytime and we love to sing this one and dance with our egg shakers. Pig on Her Head – This one is also great for walking like animals and learning animal sounds! As for Miss Patty: she’s awesome at educational-interactive music for children. Check out some of her super-fun active kids’ songs at her website, or pick up this bestseller DVD that has 13 of her best action songs for children. Phew! Mama, if your sick-of-hibernating bear cub is not cured of his cabin fever after these thirty indoor games for kids, then you can call me the White Witch of Narnia. Don’t worry though, I’m sure you’ll find many on this list that will do the trick. In no time at all, you can turn your cantankerous cub into a grinning grizzly—worn out and ready for bedtime. Plus, time flies when you’re having fun. And I bet you’ll have so much fun with these indoor games for kids that spring will be here before you know it—complete with warm weather and sunshine. But, until then… balloons, scavenger hunts, forts, and silly songs to the rescue! Which idea from this list do you think your little one will like best? Try it today! If you find that the bigger hurdle is curing your own cabin fever, check out our fantastic list of 27 Cures for Mommy Cabin Fever. Hey, your kid isn’t the only one who needs a little TLC during the long winter months! 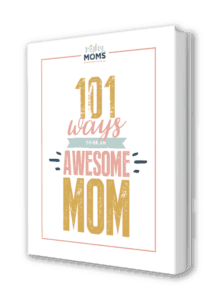 In addition to being a wife, stay-at-home mom, and regular writer here at Mighty Moms, Christi does freelance graphic design work, and manages her Etsy shop. She also enjoys photography, fine art, spending time with family and friends, being organized, chocolate, reading, and being outdoors. Get to know her better!